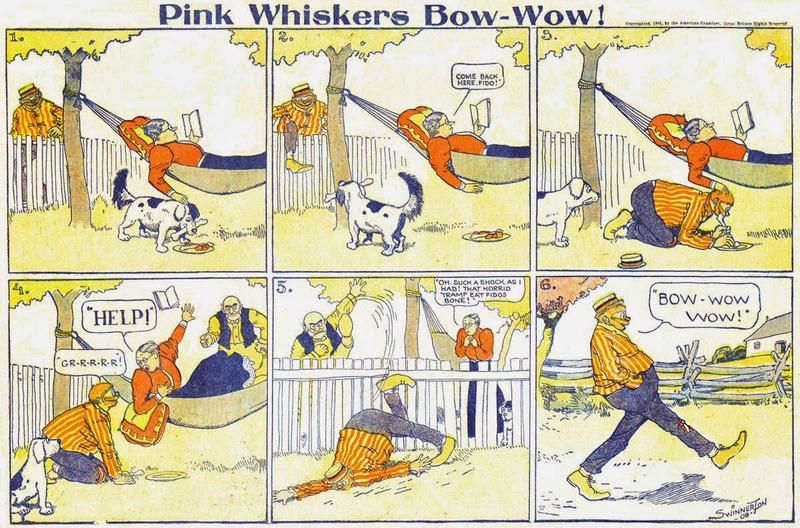 There's not much that is terribly memorable about Jimmy Swinnerton's Pink Whiskers Jones except for the title. 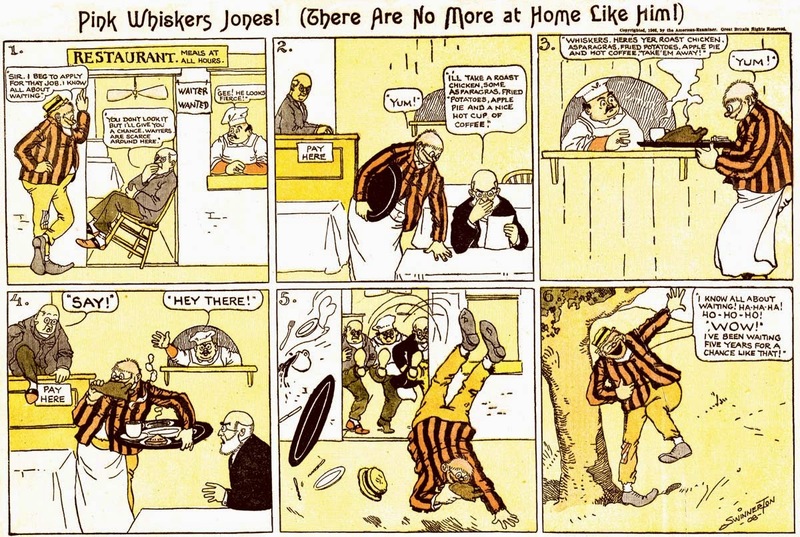 The strip's oddly named star is a hobo who will go to great lengths to steal a meal or a drink, and those fellows were a very common commodity on the comics pages of the 1900s. Swinnerton's nod to originality was in the way Roy Delancey "Pink Whiskers" Jones took his inevitable setbacks. He was ridiculously cheerful about his situation, even after being beat up by a bouncer or ripped to shreds by a guard dog. I don't know if the fellow's name had its origin in contemporary slang for a red-head, or some other source. There is an obscure cocktail called a Pink Whiskers, but I doubt that has anything to do with Swinnerton's character name. Anyone have any ideas? 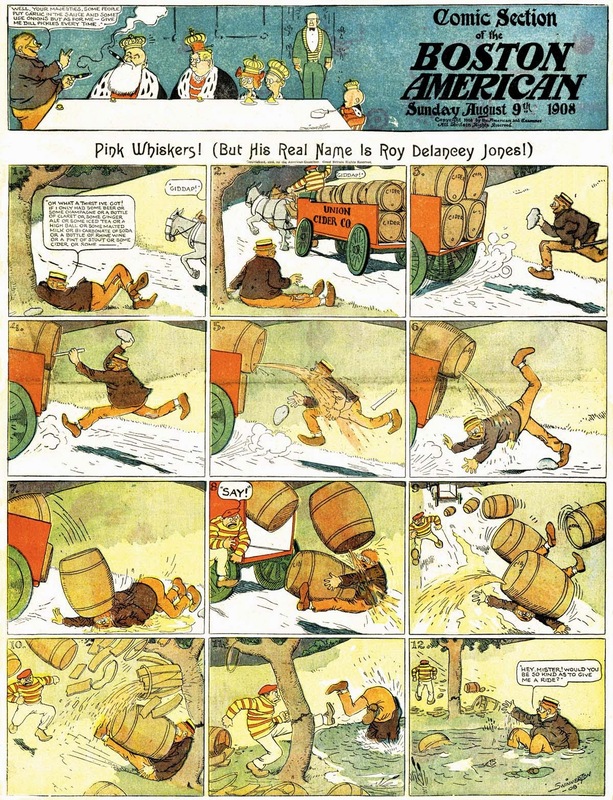 Pink Whiskers Jones ran from July 26 to November 15 1908 in the Hearst Sunday funnies sections. The samples above are courtesy of Cole Johnson. Thank you Cole!